It seems to have sparked quite a range of reactions and scorelines with average aggregates from the 'too hard' 58 at the Parr's Wood to the 'very respectable' 72 at the Griffin. "The quiz paper was very well received and, as the scores suggest, just the right level of difficulty and balance. The 3 clues to a surname with the philosopher theme gets the round of the week - the cricketing Nobel laureate and cricketing PM, the pair of the week." "So it was a tough paper and quite hard work for QMs and teams alike. Redemption came in the range of subject matter which gave for quite a few laughs and subsidiary discussions." "By universal consent this was a cracking paper - good aggregate scores and plenty to chat about with the occasional LOL moments." 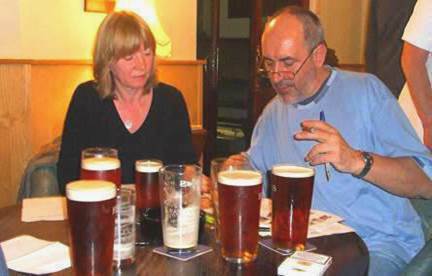 "Fairly hard quiz tonight and, as often the case, the Dunkers managed to expose the dearth of our knowledge on many topics." "The themes and connections were reasonably gettable and the running theme in Round 3 a tour de force (with even the spare contributing)." "This was an imaginative quiz especially the linked round. It was better suited for conferring than for scoring twos." "Wow...Christmas certainly arrived with a bang with tonight's offering from the Meat Rafflers. No less than 3 Christmas themes in the second half!" A popular offering earning the highest average aggregate score of the season so far. It was on the tougher end of the scale. Most of you agreed this was an excellent start to 2015. Plenty of variety and interest with idiosyncrasy given its head in Round 6 (which nevertheless provided the Question of the Week). There was little if any tricksiness and most rounds galloped along at a cracking pace. There were variations in the difficulty however, with the second half considerably easier than the first half. "As ever with Charabancs papers there were plenty of fun topics and amusingly crafted questions. The 'buts'? Well I didn't like the 2 'which words with the same endings' questions - far too vague." After last week's flurry of opinion this week saw a good straight down the middle paper which notched a healthy average aggregate. High scores all round - indeed dramatically high scores all round. "Excellent quiz - only five unanswereds - and a very high overall 'enjoyment' factor." "Although a few questions went unanswered we did learn a lot of interesting new facts and there was plenty of variety to keep us interested." This was a toughish paper but rammed full of interesting material. The questions were fairly long-winded but, in most cases, full of material that helped in the quest for an answer. "A very varied set of questions tonight with some being (allegedly) ridiculously easy and some nigh on impossible." "Gosh that was a long night. As usual a very clever quiz from TMTCH, but I wish we had started the quiz a few hours earlier to really appreciate the subtleties of the questions." "Dave spends so long on his quizzes, and they are so carefully constructed, that it seems a pity to spoil them by giving answers." "We thought this was the best Meat raffle paper to date with plenty of twos on offer but also a good number of questions where the answer could be achieved after a lot of team work." "Tonight's questions from the Opsimaths went down well with a good array of subjects to answer and plenty to enlighten and inform." This was on the tough side compared to some recent papers. "Subject matter generally well received." "Rounds which tickled our fancy included the 'Poisons' round, the Ship theme and the Bells. So many good confounders and tip of the tongue answers tonight."